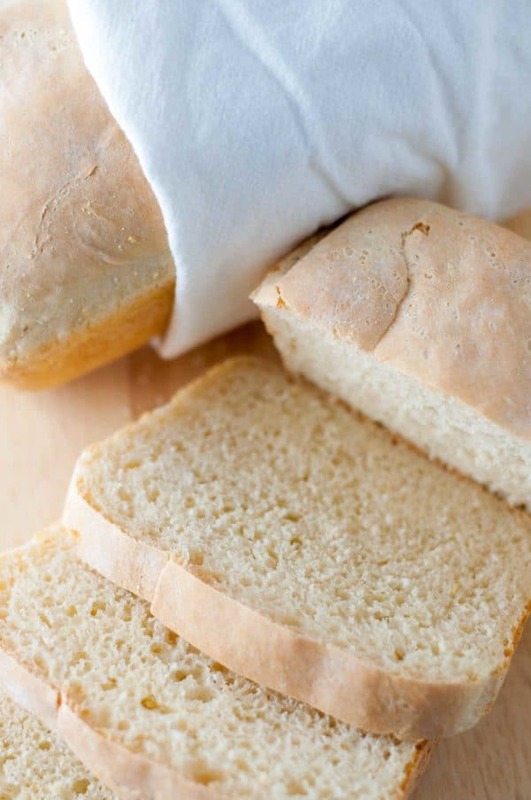 Easy English Muffin Bread is a quick and easy introduction to yeast bread making. It only requires one rise, so you’ll be enjoying delicious homemade bread in no time at all! This might be a stretch, but just hear me out. Living and (literally) breathing this house addition project has made me realize what it must feel like to be an amateur in the kitchen. Similar to beginner cooks, I have no idea what tools these construction workers are holding or what they plan on doing with them. The whole process of ground-up construction is something I’ve never had the pleasure of witnessing so up close and personal. Yada, yada, yada hammer. Yada, yada wood, yada, yada. Yada nail yada, yada, yada? When I wake from my daze of feigned comprehension, I realize I must have an intelligent response for something I’ve completely tuned out. I’ll later try to replay the conversation to Ryan so he’s in the loop, but I just get a baffled look because a lot of key points have gotten lost in translation. All kinds of culinary terminology and technique gets thrown around when talking about cooking. Something I am familiar with simply because I’ve had a ton of practice and enjoy doing it, is probably very intimidating to a novice. Especially when it comes to making bread. People freak out when you tell them you made the bread. It always catches me a little off guard because when you whip out homemade bread they think you are some sort of baking savant. I always insist it’s really not hard, but I often get a look like I just told them natural childbirth doesn’t really hurt. If you are one of those peeps who has never made homemade bread because you don’t think you have what it takes, this Easy English Muffin Bread recipe is your game changer. It was the first bread I started making, and I can honestly say it’s always turned out. Easy English Muffin Bread is my favorite bread to make because it only uses one rise, it’s quick to throw together, and it makes two loaves! Prepare for family and friends to grovel at your feet and fill you with an inflated sense of competency. 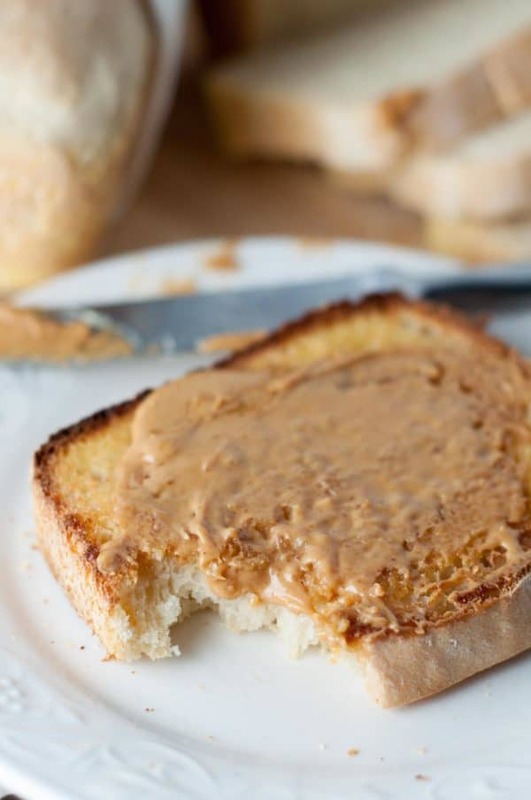 SAVE THIS EASY ENGLISH MUFFIN BREAD TO YOUR PINTEREST BOARD! Easy English Muffin Bread is so quick and easy to throw together, it is a perfect introduction to bread making! Since this bread only requires one rise, you'll be enjoying delicious homemade bread in no time at all. In a stand mixer combine 3 cups flour, yeast, sugar, salt, and soda. In a saucepan heat milk and water until just warm. Add to flour mixture and combine. Switch to a dough hook and gradually add rest of flour until a stiff batter forms. Dough should be smoother and not too sticky. Spray two bread pans with cooking spray and sprinkle cornmeal on bottom of pan. Split and shape dough between the two pans, and sprinkle more cornmeal on top of bread dough. Cover pans with cloth and let rise in a warm place for about 1 hour, until bread is doubled and risen top of bread pans. Preheat oven to 350ºF. Bake for 30 minutes until golden. Turn onto wire racks to cool. This is perfect toasting bread. We usually serve it with butter and peanut butter or butter and homemade jam. I usually let the bread cool completely down, slice it, and then freeze. It's great to pull out slices for breakfast toast or sandwiches.